For some reason I am the only person I know who understands that every cafe needs a sofa, so I thought that I should explain why. WHY? A good cafe is a comfortable place to sit around for hours on end and chat to friends, just like your lounge at home but with a better selection of coffee and of people. So a cafe needs a sofa for the same reason that your lounge does. 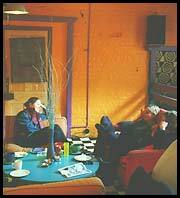 The real question, then, is why a cafe should be like your lounge. As far as I am concerned, cafes are different from pubs, bars, restaurants and nightclubs because those are places that you go to when you want to go out to eat, for a drink or to dance. A cafe is where you go to meet up with people when that's not what you fancy, especially when you just want to sit around idly all afternoon. Some cafes think that their raison d'être is good coffee. Coffee is certainly an important part of sitting around drinking coffee (and every cafe should have good coffee) but it is not the most important part. Like your lounge, a good cafe is multi-purpose - if you're not going to sit around and chat then you might want a book to read. This is why lots of people have a bookcase in their lounge. Fortunately, quite a few book shops, such as Borders, have caught on. There is even the odd cafe that has caught on and installed book shelves. CB1, on Mill Road in Cambridge, is my favourite example. Good cafes are not completely like your lounge, because your lounge probably has a television in it. The cafes are right and you are wrong - you would be better off throwing the television away. WHY?